Would you destroy humanity’s only hope in order to kill its biggest injustice? Deep in the heart of the Congo, a dangerous secret has been hidden from humanity for its protection. A secret linked to something so unjust that it has haunted the human race from the start of religion, and still exists today. If discovered, the veil of hope humanity holds so dear will be torn down and thrown away. Life will literally become worthless. There is also a dangerous artifact hidden along with the secret, one that claims to hold the power of resurrection. If this power falls into the wrong hands, there will be no stopping whoever wields the ancient item. Jack and Calvin fly into the dangerous jungles of Africa to find the dangerous artifact and soon discover their biggest adversary, the clandestine organization called the Bene Elohim, is also searching for the relic. As they seek out an old man living somewhere along the Congo River that supposedly has knowledge that will help them find the artifact, a mysterious teenage boy abducts Jack. With a machete in each hand and only a direction to follow, Calvin runs off into the jungle in hot pursuit, both arms swinging! Will Calvin save Jack? Do they find the artifact and face destroying the only hope mankind has left? 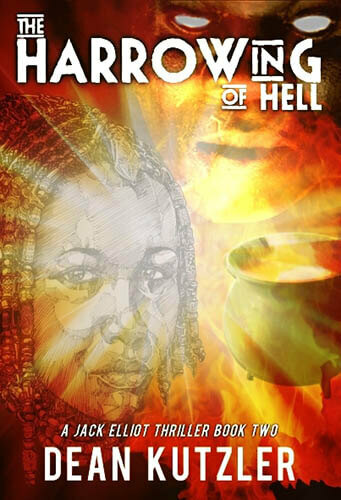 The Harrowing of Hell, the second adventure in The Jack Elliot Thriller Series, is sure to deliver fast paced, thrilling action and adventure that isn\'t laced with guns, bombs and nuclear genocide—but loaded with mind bombs that\'ll have you thinking twice! It is brilliantly plotted, full of twists and its feet are fully submerged in suspense.